Today’s outfit is of course a festive one! It’s a black ‘n white dress from H&M that I have bought several years ago, but I just don’t come around to wearing it often. It is very beautiful however and perfect for Christmas! The cut from this dress is simply made for women with curves or an hour glass figure… as I’ve got both it’s just perfect for me, isn’t it 😀 I love the draped front, which makes this dress extra glamourous and elegant. I am wearing this dress with a beautiful handmade necklace. My nailartist is such a creative woman… she makes beautiful jewellery from little pearls and this necklace is so chic! It’s got a bit of a twenties feel to it, don’t you think? 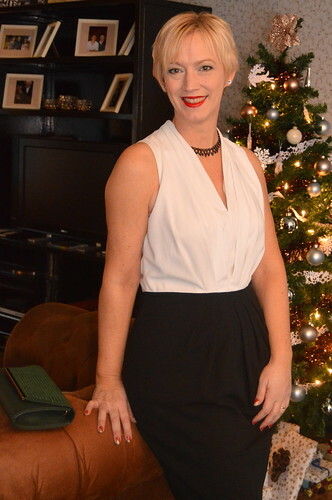 My Wolford stockings, silver Tamaris pump, lovely green clutch and fab red lips complete the look. What do you think… Christmas-worthy or not?! Take a look at last year’s Christmas outfit! This entry was posted in Fashion, Outfits, Winter and tagged Fashion, H&M, outfit, party dress, tamaris, Winter, wolford. Very nice! Have a wonderful Christmas!